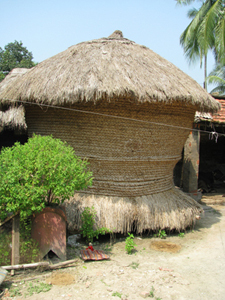 October 4, 2011, Daspore Village, West Bengal, India. We turn the clock backward to introduce this date, when a most memorable Manick Sorcar show took place at this remote village near Panduah, West Bengal. The invitation for the show came from Dr. D.P. Chaudhuri, a renowned doctor of North Carolina, USA, whose ancestors were the landlords of the village, which his father inherited and improved upon by providing education and medical help. His elder brother, Sri Kalika Prasad, a Gandhi follower, devoted his life to upgrade the life in general of the village people. 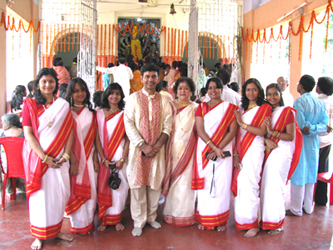 Celebrating Durga Puja was a tradition for them and a most popular event at the village since over 400 years. 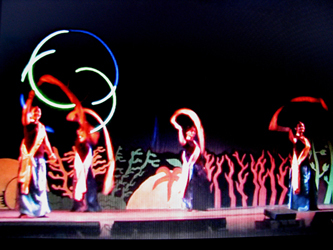 In recent years they started inviting cultural shows and performing groups to entertain the villagers. This year they selected Manick Sorcar Production's Laser Fantasy to “introduce a renowned show that is so different from any other, made with the magic of laser – giving a taste of the 21st Century technology to the villagers”. Providing the technical needs of the show in a remote village was a challenge, but they met it meticulously by building a large, covered stage abiding MSP specifications, complete with theatrical lighting, a professional sound system, all backed by a remote high-power generator. 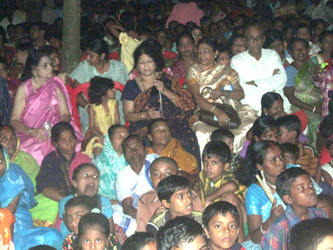 The venue was the playground of an adjacent school, which was packed with the villagers. In fact, there was so much crowd that people stood at far end beyond the playground, sat on trees, and at balconies and roof of the school patiently awaiting experiencing the extravaganza of dance-drama-magic in combination with laser. 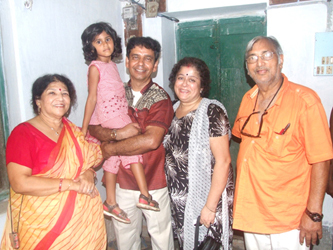 What made the show extra special was that it also happened to be a happy day for Dr. Chaudhuri’s grand daughter Leeya, 4.5 years, who was there from the USA, an admirer of the children's songs and animation of Manick Sorcar. Manick surprised her by inviting her on stage for a chit chat and then continuing with the next item with her favorite song “Aoy Ajagar Aaschhe Tere” (The Python chasing me) dedicated to her with her laser-portrait in it. It was a heart-warming experience for all as “Aoy Ajagar Aaschhe Tere”, based on a popular nursery rhyme of Bengal, was actually sung by Manick’s younger daughter Payal, then 5, with a strong American accent not much different from that of Leeya. So the match was perfect! 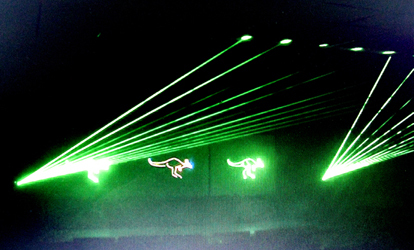 Manick Sorcar’s “Laser Fantasy” show ran for almost two hours. People gathered after the show to meet with him and congratulate the performers. The villagers kept talking about the show and their favorite items for days after it was over. As the MSP group walked down the village to attend the Durga Puja celebration at the temple, the villagers welcomed them again with beaming smiles and folded hands, “This was the most spectacular experience we have ever had, God Bless you for bringing your light magic to our little village”.